via photos and found ways to improve the interpretation of both of them, Casineria (Fig. 1) and Diplovertebron (Fig. 2). Figure 1. Manus of Casineria, a basal archosauromorph reptile. The carpals are unosssified, but left vague impressions in the matrix. Other bones overlapped the carpals and are removed here. PIls added. Diplovertebron punctatum (Fritsch 1879, Waton 1926; DMSW B.65, UMZC T.1222a; Moscovian, Westphalian, Late Carboniferous, 300 mya) aka: Gephyrostegus watsoni Brough and Brough 1967) and Gephyrostegus bohemicus (Carroll 1970; Klembara et al. 2014) after several name changes perhaps this specimen should revert back to its original name as it nests a few nodes away from Gephyrostegus. Derived from a sister to Eldeceeon, Diplovertebron was basal to the larger Solenodonsaurusand the smaller Brouffia, Casineria and Westlothiana. Diplovertebron was a contemporary of Gephyrostegus bohemicus, Upper Carboniferous (~310 mya), so it, too, was a late survivor. Overall smaller and distinct from Eldeceeon, the skull of Diplovertebron had a shorter rostrum, larger orbit and greater quadrate lean. The dorsal vertebrae formed a hump and had elongate spines. The hind limbs were much longer than the forelimbs. The tail is incomplete, but appears to have been short and deep. Seven sphere shapes were preserved alongside this specimen. They may be the most primitive amniote eggs known. Figure 2. Diplovertebron manus in situ and reconstructed with PILs added. What appear to be displaced carpals may be something else entirely. The carpals may have been unossified, as in Casineria. See how DGS makes reconstruction less chaotic? Casineria kiddi (Paton, Smithson & Clack 1999) Visean, Mississippean, Carboniferous, ~335 mya was a small basal archosauromorph. the oldest but not the most primitive. It was derived from a sister to Diplovertebron and Solenodonsaurus. Westlothiana was a sister taxon. Overall smaller than and distinct from Gephyrostegus, the skull of Casineria had no otic notch. See Brouffia for more possible skull details. The cervicals of Casineria were increased in number but decreased in size. The presacral vertebral count had increased to over 30. Ribs discontinued after #22. Apparently two vertebrae formed the sacrum and were connected to the pelvis. The pectoral girdle was composed of unfused elements. The humerus had a small hourglass shape. The manus was enlarged. The ilium had no anterior dorsal process. The femur was more gracile. The pes was reduced, more nearly the size of the manus. Brough MC and Brough J 1967. The Genus Gephyrostegus. Philosophical Transactions of the Royal Society of London. Series B, Biological Sciences 252 (776): 147–165. Fritsch A 1879. Fauna der Gaskohle und der Kalksteine der Permformation “B¨ ohmens. Band 1, Heft 1. Selbstverlag, Prague: 1–92. Klembara J, Clack J, Milner AR and Ruta M 2014. 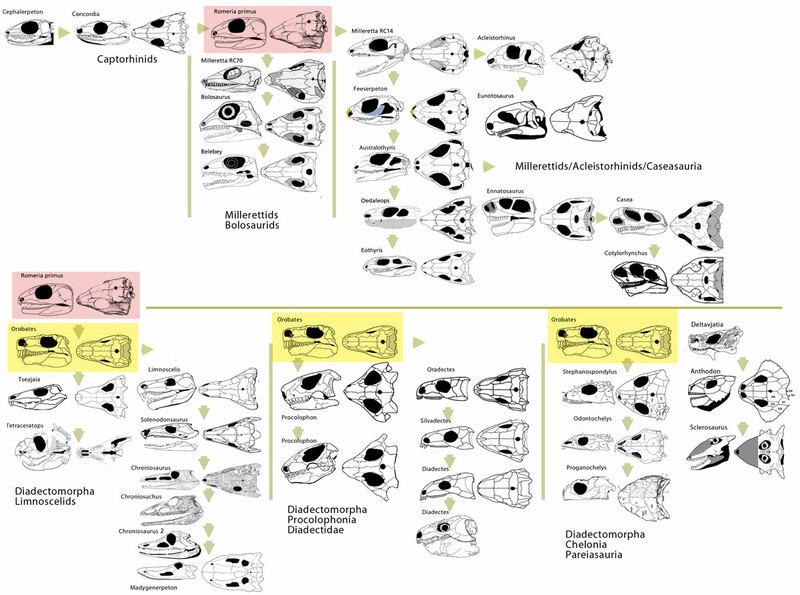 Cranial anatomy, ontogeny, and relationships of the Late Carboniferous tetrapod Gephyrostegus bohemicus Jaekel, 1902. Journal of Vertebrate Paleontology 34:774–792. Paton RL Smithson TR and Clack JA 1999. An amniote-like skeleton from the Early Carboniferous of Scotland. Nature 398: 508-513. Watson DMS 1926. VI. Croonian lecture. The evolution and origin of the Amphibia. Proceedings of the Zoological Society, London 214:189–257. developed extra dermal hair-like structures: mammals, dinosaurs (reaching an acme in birds) and pterosaurs. Traditional thinking holds that reptile scales evolved early, along with the origin of the amniotic membrane. Both of these were viewed as adaptations to a non-aquatic, (i.e. ‘dry’) environment. Unfortunately there’s very little evidence for scales in the earliest reptiles (see below). They appear to have lived in a moist coal forest leaf litter environment throughout the Carboniferous. are key to discussions on reptile skin: alpa-keratins and beta-keratins. Perhaps a correction here: In the large reptile tree there is no clade “Sauropsida.” Rather synapsids are more derived than the basal reptiles that ultimately evolved into the other amniotes. So, if beta-keratins had a single origin, mammals and perhaps their closest ancestors lost the capacity to produce beta-keratins. Phylogenetic bracketing indicates this could have happened at any node between Protorothyris and Megazostrodon. When did scales arise? And are lizard scales homologous with those of turtles, crocs, birds, pangolins and opossum tails? Unfortunately fossils of skin and scales are rare. As you’ll recall, reptiles divide at the start into two lineages, the Lepidosauromorpha and the Archosauromorpha. The most primitive appearance of dermal tissue in the lepidosaurorph line occurs with the scutes of pareiasaurs, Sclerosaurus and basal turtles. These include a bony base. At some point turtles developed scales that covered the face and limbs, but when is not known. My guess is as far back as Stephanospondylus because it was a large and tasty herbivore. Otherwise nothing on scales appears until Xianglong, a gliding basal lepidosaurifom (not a squamate). Li et al. 2007 report, “The entire body including the skull is covered with small granular scales, which show little size variation.” Perhaps noteworthy, this is the node at which some short-legged, ground-dwelling flattened owenettids evolved to became large-limbed and arboreal, exposed to the dry air above the damp leaf litter. Perhaps more misunderstood, those wing spars are actually ossified dermal extensions, as in a sister taxon, Coelurosauravus, not extended ribs, as we carefully considered earlier here and here. Figure 1. Xianglong, a basal lepidosauriform with dermal extensions, not ribs, with which it used to glide. Then there’s Sphenodon, an extant basal lepidosaur with a variety of large and small scales, some were overlapping and others were not. Basalmost sphenodontids, like Pleurosaurus, were trending toward an aquatic niche. Sphenodon is a burrowing and foraging reptile. the best clue to basal sphenodontid squamation comes from a tritosaur sister, Tijubina (see below). Of course, all living lizards (squamates) have scales. and they shed their skin in whole or in patches during ontogeny. The basal tritosaur, Tijubina, preserves rhomboid scales on the neck, large rhomboid scales on the trunk and annulated ones on the ventral side of the entire caudal region. Not far removed from Sphenodon with regard to squamation. By contrast, a more derived tritosaur, Huehuecuetzpalli preserves tiny disassociated calcified granular scales over its dorsal neural arches. A more derived tritosaur, Macrocnemus (Renesto and Avanzini 2002), had a scale covering in the sacral and proximal caudal region. The scales of Cosesaurus (Ellenberger and DeVillalta 1974, Fig. 2) were about the size of the matrix particles in its mold, so they have not been described. However, Cosesaurus had extra dermal tissues in the form of a gular sac, a dorsal frill, fibers streaming from the posterior arm, uropatagia trailing the hind limbs and long hairs emanating from the tail. A larger sister, Kyrgyzsaurus had scales and similar extra dermal ornaments. Sharovipteryx shares these traits and accentuates the uropatagia. Longisquama shares these also but accentuates the dorsal plumes. The latter two taxa also have pycnofibers (hairs) at least surrounding the cervical series. Their sisters, the pterosaurs, accentuate the trailing arm fibers, which become fiber-embedded foldable wings. Pterosaur ‘hair’ reaches its acme in Jeholopterus, which may have used its ‘hair ball’ as a barrier to insects likewise attracted bloody patches of dinosaur skin. In certain basal pterosaurs the tail hairs coalesce to become tail vanes. Figure 2. Click to enlarge. The origin and evolution of Longisquama’s “feathers” – actually just an elaboration of the same dorsal frill found in Sphenodon, Iguana and Basiliscus. Here the origin can be found in the basal tritosaur squamate, Huehuecuetzpalli and becomes more elaborate in Cosesaurus and Longisquama. It is clear in fenestrasaurs that extra dermal membranes were secondary sexual traits, decorations that enhanced their chances for mating. Hairs ultimately became barriers or acted as insulation. Arm fibers ultimately became wings. Like the basal lepidosauromorph, Cephalerpeton, basal archosauromorphs like Eldeceeon had ossified belly scales in V-shaped patterns, but not coalesced to form gastralia. Pelycosaurs lacked scales. They were naked. So were basal therapsids as far as the fossil record goes. Estemmenosuchus (Chudinov 1970), an herbivorous therapsid, preserves no scales, hair or hair follicles. However, the preserved skin was well supplied with glands. Since all living basal mammals (Fig. 3) are richly endowed with fur, that trait probably extends to the first tiny egg-laying mammals, denizens of the leaf litter. In tiny animals, so in contact with the substrate, the leaf litter and water, hair appears to have developed not only to insulate its little warm-blooded body, but also to act as a barrier to all dermal contact with the environment. Insects, like fleas, had to lose their wings to burrow past the hair to get to the skin. Figure 3. This is Amphitherium a basal mammal. In basal diapsids, the sisters of basal synapsids no dermal material has been found. Plesiosaurs and ichthyosaurs were naked, so pachylpleurosaurs, thalattosaurs and mesosaurs were likely naked as well. A rare exceptions, the thalattosaur Vancleavea, was covered with large bony scales. Hupehsuchids had short bony plates over the neural spine tips. For protorosaurs or proterosuchids no dermal scales have been reported. Dorsal armor developed as large plates in the likely piscivore Doswellia, and to a less degree in Champsosaurus, Diandongosuchus, and then again to a greater degree in parasuchids, proterochampsids and chanaresuchids. For euarchosauriformes a line of dorsal scutes also appeared on the dorsal midline of Euparkeria and many descendant taxa (except finbacks and poposaurs). The herbivorous Aeotosaurs, Revueltosaurus and Simosuchus independently expanded their armor in similar ways. So did the carnivorous extant alligators and crocodiles and their ancestors. However basal bipedal and near-bipedal croc taxa, like Gracilisuchus do not preserve scales, other than their dorsal scutes. These may have enhanced the strength of the backbone. Otherwise, basal bipedal crocs were likely not heavily scaled, and neither were the oceanic swimmers, like Metriorhynchus. That brings us to dinosaurs. Kaplan (2013) reports “the overwhelming majority had scales or armor.” We’ll cover dinosaur scales and dinosaur feathers in more detail in part 3: feathers. Renesto S and Avanzini M 2002. Skin remains in a juvenile Macrocnemus bassanii Nopsca (Reptilia, Prolacertiformes) from the Middle Triassic of Northern Italy. Jahrbuch Geologie und Paläontologie, Abhandlung 224(1):31-48. Chudinov PK 1970. Skin covering of therapsids [in Russian] In: Data on the evolution of terrestrial vertebrates (Flerov ed.) pp.45-50 Moscow: Nauka. Dhouailly D 2009. A new scenario for the evolutionary origin of hair, feather, and avian scales. Journal of Anatomy 214:587-606. Lecuona A and Desojo, JB 2011. Hind limb osteology of Gracilisuchus stipanicicorum(Archosauria: Pseudosuchia). Earth and Environmental Science Transactions of the Royal Society of Edinburgh 102 (2): 105–128. * too bad I did not know this when I painted Estemmenosuchus with scales for the cover of a book. Adding a few taxa to the large reptile tree generally causes a reassessment of past scorings that stand out as autapomorphies. Some of these represent earlier mistakes. When the mistakes are corrected the tree can shift the nesting of taxa. Some taxa are only one or two steps away from a minor shift anyway, especially the incomplete taxa. So this can happen. No major tree topologies have changed, however. Previously nested outside of the Archosauria, Turfanosuchus now nests at the base of the Dinosauriformes along with the PVL 4597 specimen attributed to Gracilisuchus, Trialestes and Herrerasaurus, which drops out of the Theropoda. Now nest together. No biggie. The nesting of the referred specimen of Brazilosaurus at the base of the Thalattosauria somehow shifted Largocephalosaurus and Sinosaurosphargis back to the base of the Sauropterygia (placodonts + plesiosaurs). These two are so different from their sisters, yet this nesting is only held in place by a few steps. And it’s still entirely possible that the dermal armors of saurosphargids and placodonts were derived independently. The list of protodiapsids have arranged themselves into three distinct clades, shortening the phylogenetic distance between the basal synapsid Archaeothyris and basal diapsids like Tangasaurus (Enaliosauria) and Thadeosaurus (Younginids and Archosauriformes). The basal reptile Cephalerpeton now nests basal to only the new Lepidosauromorpha. This makes the Reptilia truly diphyletic following the tiny Gephyrostegus specimen. Cephalerpeton shares more traits with those early captorhinomorph herbivores than the more insectivorous and lizardy Brouffia, at the base of the new Archosauromorpha. Bolosaurids now nest separate from the caseids and the higher Lepidosauromorpha. Odontochelys nests outside of the clade that produced Proganochelys, so developed its turtle-like traits by convergence based on the current list of characters and taxa. Another putative turtle ancestor, Eunotosaurus nests closer to caseids. Not bad for a totally new clade… Not counting all the pterosaurs, drepanosaurs, macrocnemids, etc. the Tritosauria now number 18 in the large reptile tree. Let’s put some more of these former oddballs and former enigmas into lepidosaur trees to confirm or deny this topology. It just takes a little effort and a sense of wonder. And take off those blinders! paleontologists used their wits and lists of traits to tie taxa together in evolutionary sequences. Some nestings and match-ups were easy. Others were… not so easy. Watson 1957 (Fig. 1) produced his version of the reptile family tree produced without the benefit of computers and matrices. In those days, if relationships were unknown they were unlinked in the graphics. Rarely is the entire gamut of the Reptilia presented, so here we have an early version of the large reptile tree. Figure 1. Click to enlarge. Watson 1957, his view of the reptile family tree overprinted with yellow for the new lepidosauromorpha and with blue for the new archosauromorpha from the large reptile tree. Notably, except for a few easily moved clades, this is not that far from the diphyletic tree recovered at reptileevolution.com. In the large reptile captorhinids, caseids, pterosaurs, Milleretta and Saurosternon moves to the new Lepidosauromorpha. Hovasaurus, Tangasaurus and thalattosaurs move to the new Archosauromorpha. These changes are noted by the overlying colors. Still, all in all, not too far off the mark!!! Tanytrachelos, Tanystropheus and Macrocnemus nested in Watson’s tree (Fig.1) at the base of the lepidosaurs distinct from the protorosaurs. That shows some insight. Turtles also nested with the lepidosaurs. Protorosaurs and younginids nest in Watson’s tree at the base of the “Thecodontia” now considered the Archosauriformes, as they do in the large reptile tree. Watson assumed these groups all descended from the Millerosauria. The large reptile tree confirms this relationship, with the exception of the lepidosauromorph, Milleretta, which does not nest with the protodiapsid archosauromorphs Milleropsis and Millerosaurus, but is closer to caseids and turtles and lots of other rarely reported taxa. Nowadays we know the origin of reptiles goes back a little further than the Late Carboniferous. Furthermore, we can connect all the leaves on the reptile family tree without the missing links and with complete resolution. Earlier a similar chronology of fossil reptiles using a computer-generated phylogram mated to a time chart was presented. It gives a fuller picture of Watson’s tree. Missed this earlier milestone a few days ago: We’ve passed 800 posts here. Watson DMS 1957. On Millerosaurus and the Early History of the Sauropsid Reptiles. Philosophical Transactions of the Royal Society of London. Series B, Biological Sciences 240: 673: 325-400. As promised, updates arrive, but not always promptly. Here is an updated phylogram of the large reptile tree placed against a time scale. Due to the large number of taxa (340+) it is quite impossible to read this unless you download the PDF file. Then there’s no limit to its magnification. A phylogram differs from a cladogram in showing the amount of change between taxa by the length of the horizontal bars. Longer bars indicate greater morphological change. Figure 1. The new phlogram of the Reptilia and its outgroups. Click for pdf file. Even at this scale the diphyletic nature of the Reptilia is readily apparent, as is the great flowering of reptiles in the Permian and Triassic. 1. Sometime during the Carboniferous (Mississippian + Pennsylvanian) reptiles had their origin and their original split, but not much happened or is known about them from that remote time. Reptiles remain in the minority (it was the age of Amphibians) and no great radiations occurred then. 2. The Permian was a time of great radiation for both the Archosauromorph and Lepidosauromorph lines. Among the former, synapsids paralleled proto-diapsids and early diapsids. Among the latter large diadectomorphs and pareiasaurs dominated. 3. During the PermoTriassic extinction event only a few lineages made it through. Among the new Lepidosauromorphs the turtles (Proganochelys) and the lepidosaurs (Paliguana, Lacertulus) survived. Among the new Archosauromorpha three main lines survived. Certain Permian synapsids evolved to become Triassic protomammals and Jurassic mammals. Dicnynodonts also made it through. Permian enaliosaurs like Claudiosaurus and Stereosternum gave rise to a large marine radiation in the Triassic. Permian younginoids, like Thadeosaurus and Protorosaurus, gave rise to a large terrestrial radiation in the Triassic. 4. Many of the Triassic lepidosauromorphs did not change much into the Jurassic, Cretaceous and later eras. By contrast, most of the Triassic archosaurmorphs became extinct or evolved into other taxa during later eras. 5. There are a few chronological oddballs, like Lotosaurus, a taxon claimed to come from Early Triassic sediments, but this seems at odds with the evolution of its purported temporal contemporaries and phylogenetic sisters. to see a bunch of taxa together to get an appreciation for the evolution of one to another to another and another. Well, here are the members of one branch of the basal reptiles, the early plant-eaters, the new Lepidosauromorpha, all taken from the large reptile tree (recently slightly revised). Figure 1. Click to enlarge. These skulls are arranged phylogenetically according to the results recovered from the large reptile tree. the Diadectomorpha and Chroniosuchia are nested here within the Reptilia rather than within the pre-amniotes. Contrary to conventional thinking, the Caseasauria are nested here within the Millerettidae, rather than the Synapsida. These, and other new relationships were determined by adding taxa and thereby expanding the gamut of opportunities for every taxon to nest most parsimoniously – where the changes between taxa are minimized echoing the actual tree of reptile evolution. Romeria primus (Fig. 1 in pink) – is at the base of the millerettids that begat the bolosaurids, acleitorhinids (not related to Lanthanosuchus btw), and the caseasauria, which now has new basal members, Feeserpeton and Australothyris. Romeria primus was largely ignored in prior studies. Now, perhaps, its importance will no longer be overlooked. Orobates (Fig. 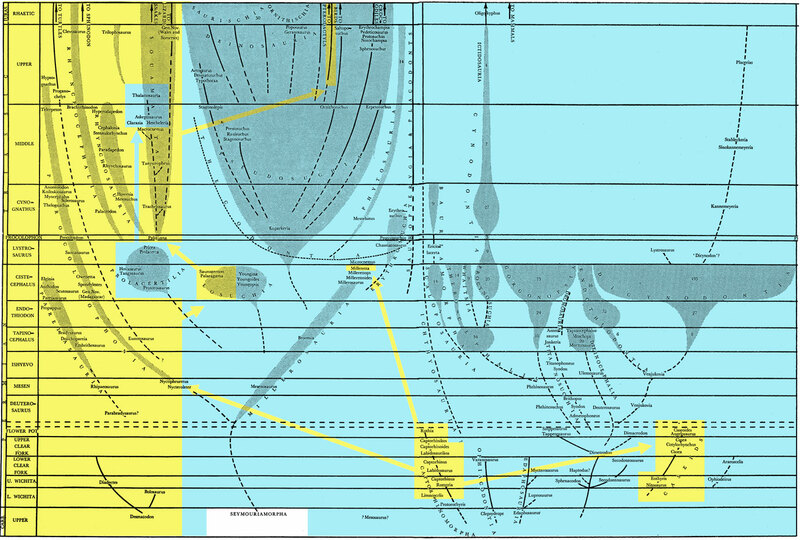 1 in yellow) – is leading the way toward Tseajaia and Tetraceratops, Limnoscelis, Procolophon, the lineage of Diadectes, Chelonia beginning with Stephanospondylus, and not finally the Pareiasauria. Orobates, likewise needs to rise in importance and needs to be added to several more focused phylogenetic analyses. Figure 2. Click to enlarge. 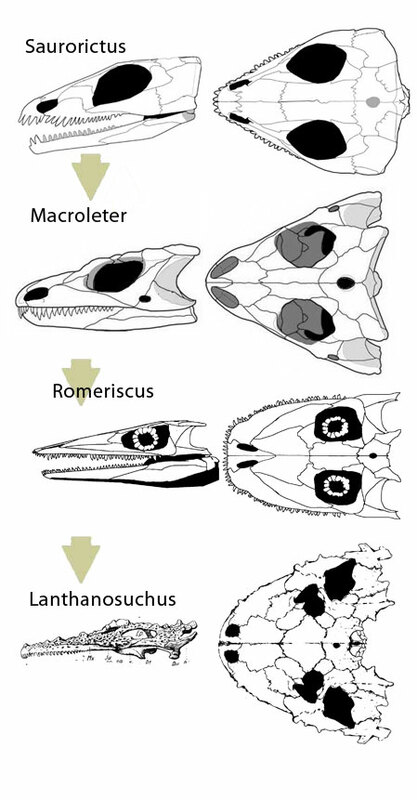 Saurorictus, Macroleter and the lanthanosuchids, Romeriscus and Lanthosuchus. I say not finally because the next clade includes Saurorictus and Nyctiphruretus (Fig. 2) and the remainder of the new Lepidosauromorpha, including lanthanosuchids (Fig. 2), owenettids and the Lepidosauriformes. All taxa demonstrated gradual transitions from one to another. With this new phylogeny and tree topology the taxa that may or may not be someday discovered can more accurately be predicted based on phylogenetic bracketing. Hopefully more discoveries will help find the sisters of Orobates that will help define the base of this new, hitherto unknown clade. Hopefully readers will glean the important fact that limnoscelids, chroniosuchids and diadectids are not amphibians (pre-amniotes), which represents conventional thinking. No, they’re nested deep within the Reptilia, far from Gephyrostegus and its ancestors and their kin. Because Eudibamus is not a bolosaurid. It is a basal diapsid close to Petrolacosaurus. Strong foot homologies and long suite of other traits nest it there, not with heavy, plant-eating bolosaurids.